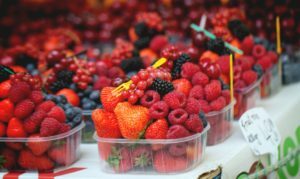 Certain foods are lauded for their antioxidant powers and we’re always told to eat more of these foods to help combat damaging free radicals in our bodies, but what are antioxidants and what is it they actually do? First, What’s Up With These Free Radicals? In order to understand what antioxidants are, first, we need to define free radicals. According to the National Cancer Institute (NCI): “Free radicals are highly reactive chemicals that have the potential to harm cells.” They are created when a molecule (two or more atoms) or an atom either loses or gains an electron. Free radicals are formed naturally in the body and play an important role in many normal cellular processes, BUT, at high concentrations, free radicals can damage all major components of cells, including DNA. This cell damage, subsequently, contributes to the degenerative changes of aging, as well as may play a role in the development of age-related diseases and other health conditions, including cancer. Antioxidants are the answer to free radicals. They are chemicals, also sometimes referred to as micronutrients that interact with and neutralize free radicals, stopping them from causing harmful cell damage. Our bodies produce some antioxidants to deal with the free radical problem, but it’s less than we need. In order to obtain the level of antioxidants we need, we must rely on external sources, like diet, hence the push for eating antioxidant-rich foods. Vegetables, fruits, and whole grains are rich sources of dietary antioxidants, such as beta-carotene, lycopene, and vitamins A, C, and E. Plant foods also have phytonutrients, which act as antioxidants. — Antioxidant-rich beverages include pomegranate juice, prepared green tea, grape juice, prune juice and black tea. Beverages containing the LEAST antioxidants include beer, soft drinks and ginger ale, with drinking water at the very bottom with no antioxidants (though water and proper hydration plays a crucial role in good health). — Among grains, barley, buckwheat, and millet flours are the flours with the highest antioxidant values, while the grain products containing the most antioxidants include crisp bread and whole meal bread with fiber. — The majority of dairy products are low in antioxidant content. — The average antioxidant content of berries and berry products is relatively high. Examples of antioxidant-rich fruits and vegetables are artichokes, dried apples, lemon skin, flour made of okra, dried apricots dried plums, red and green chili, prunes, and curly kale. Examples of fruits and vegetables in the medium antioxidant range are red cabbage, dried mango, dried dates, paprika, black and green olives, red beets, plums, and guava. For more detailed information of the NCBI study, visit http://www.ncbi.nlm.nih.gov/pmc/articles/PMC2841576/. A healthy diet is an essential part to a healthy lifestyle. If you haven’t done so in a while, it would be a good idea to take a look at what you have in your refrigerator and your pantry, make a list of what you have, and decide whether it is lacking in antioxidant-rich foods. We are what we eat, so if we want to BE healthy, we need to EAT healthy!